Have you counted sheep until sunrise? Have hard time on the bed falling asleep? You have an occasional problem with insomnia, but don't worry. 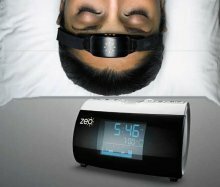 Check this out and improve your sleep quality! Avoid "night caps," (alcoholic drinks prior to going to bed). What is insomnia, and is it prevalent? Insomnia simply means difficulty sleeping. It is among the most prevalent psychological health problems, with at least 1 in 10 people suffering from insomnia chronically (Tang & Harvey, 2006). In fact, Hamilton et al. states large-sample surveys have suggested that between 13% and 52% of those surveyed report at least occasional problems with insomnia. A review of the literature on insomnia suggests that the cause and course of insomnia are highly variable. Although many people experience primary sleep disorders, sleep disturbances are a common side effect of many medications (e.g., SSRI antidepressants, decongestants); are related to use of many psychoactive substances (e.g., alcohol, tobacco, caffeine); and are included in the symptom profiles of many anxiety and mood disorders. Occasional or acute episodes of insomnia are often related to environmental stressors (such as noisy neighbors), job stress, or personal stressors, such as divorce or bereavement. In contrast, clinically significant insomnia lasts for at least 1 month and causes significant distress and impairment (Hamilton et al., 2007). Insomnia has serious consequences, including impaired cognitive function, functional impairment, work absenteeism, increased use of medical services, and doubling the risk of accident. In the United States, the direct and indirect costs associated with insomnia were conservatively estimated to be between $92.5 and $107.5 billion per year (Tang & Harvey, 2006). 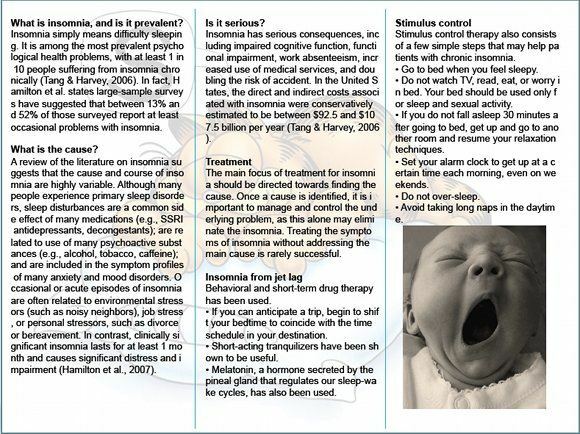 The main focus of treatment for insomnia should be directed towards finding the cause. 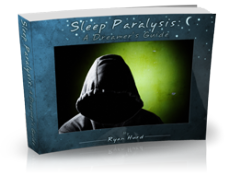 Once a cause is identified, it is important to manage and control the underlying problem, as this alone may eliminate the insomnia. Treating the symptoms of insomnia without addressing the main cause is rarely successful. Behavioral and short-term drug therapy has been used. If you can anticipate a trip, begin to shift your bedtime to coincide with the time schedule in your destination. Short-acting tranquilizers have been shown to be useful. Melatonin, a hormone secreted by the pineal gland that regulates our sleep-wake cycles, has also been used. 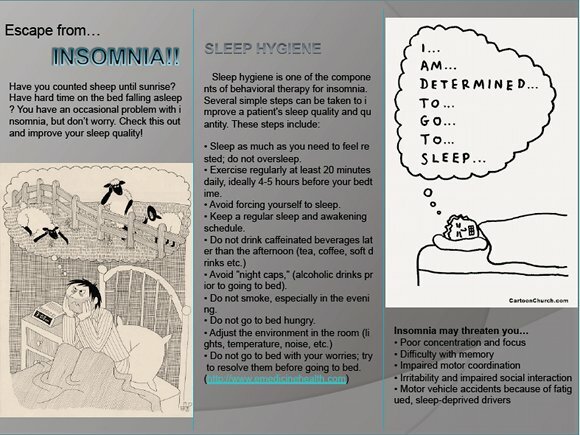 Stimulus control therapy also consists of a few simple steps that may help patients with chronic insomnia. Do not watch TV, read, eat, or worry in bed. Your bed should be used only for sleep and sexual activity. If you do not fall asleep 30 minutes after going to bed, get up and go to another room and resume your relaxation techniques. Set your alarm clock to get up at a certain time each morning, even on weekends. Avoid taking long naps in the daytime.